With the successful launch of a Streetcar, the Kansas City River Market area has seen a recent real estate development boom. Two real estate development companies snapped up a critical piece of property and quickly designed a remarkable building to add to the Kansas City skyline. Among other development projects, they knew they needed to distinguish themselves. But how do these developers stand out and compete with the other residential options? How do they market a community and get signed leases before they’ve even broken ground? A solid brand, digital experience, and compelling message! To accomplish this, they enlisted ZIV to create a brand experience, from logo to website, that augmented the property design and interior which radiated luxury. The goal: an urban country club vibe. With a handful of renderings, a passionate team and a vision – ZIV and the 531 Grand team set out to create a market leader among the Kansas City skyline. As with every project, ZIV held in-depth information sessions to understand the vision, the vibe the new community needed to portray, and the ultimate goal of the project – a luxury brand and website that converted prospects to signed leases. 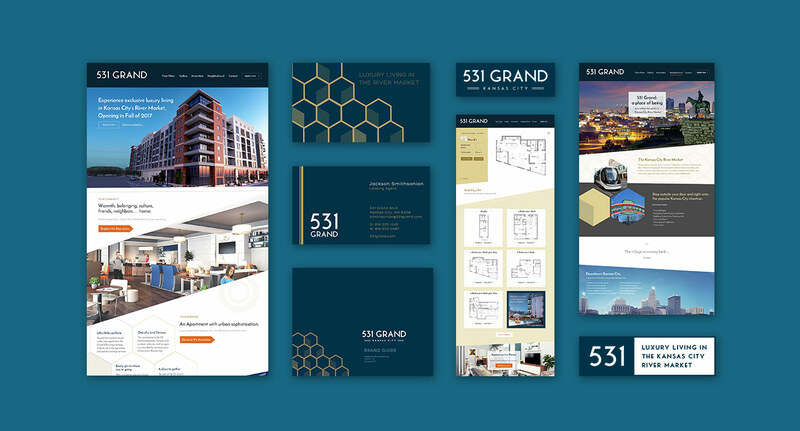 ZIV presented mood boards to set the tone for the new logo and supporting brand identity pieces along with a competitive analysis of area developments and research on target markets. All of these insights informed the ZIV team throughout the entire process. At their ribbon cutting 531 Grand celebrated 86% of the building leased and 71% occupied. Next time you’re in the Kansas City River Market make sure to stop in and experience this unique urban luxury for yourself or visit 531 Grand.com! Ready to step up your brand experience?